I’m often asked if I get bored. The simple answer is ‘no’. To me being bored is all about having spare time and energy but not knowing what to do with it. A classic kids ailment. Of course I get bored of pain and of not being able to do things I would like, but I’m never actually thinking ‘I’m bored’. Today I’m laying in bed thinking about how I could clean the roof light windows in our bedroom. I’ve spent at least an hour a day since we moved into this bedroom three years ago wondering how I could do it. It’s a super ten pained oblong pitched window with ‘self cleaning’ glass and a white UPVC ( sadly couldn’t afford wood) frame. I thought the point of self cleaning glass and UPVC is that I wouldn’t have to be spending any time thinking about how to clean it, however despite rain helping keep the outside clean, the inside needs a good wash. The cobwebs are regularly swept down by a very cool long angled brush and mop I bought especially, but you just can’t get the pressure needed to scrub it. Where our bedroom is facing North East it is quite cold and so we do get condensation, its not so bad now that we have blinds and the plaster has dried out, but the initial problem created some mould growth on the frame. 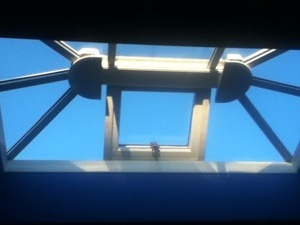 I imagine climbing onto the flat roof and working out which bits I could reach through the opening window. Not far enough no matter how bendy my joints are! I then think about the obvious solution, to move our bed and put a big ladder up. This can be moved around to ensure that nothing is missed. Moving the bed is not so simple. Where do you move a Queen sized wooden frame bed too. Luckily our room extends into a dressing room, but if the bed is moved it would block the door. Imagining that the bed issue is resolved, do you use soapy water and a cloth, or would I need a brush? Would the ladder reach high enough or would there still be points that need arms above the head? Would I get spiders falling into my hair? The next level of pondering is about how often it would need cleaning? Once sparkly and white, would any new dirt show up sooner? Would it be better to leave it as it is, I could be the only one who’s bothered by it! Hubby already has a list as long as his arm with other more important chores, and when I have dips he has to do even more and look after me more too so its quite a big ask. Then I think about tall, strong and eager cleaner friends… How would I stand with regards to health and safety with my friends up a ladder? After going through all of this I then start to think of what maybe a more manageable task, planting bee friendly plants on our roof for insulation and decoration. Would we then get mud splatters on the windows when it rains? How much gravel and soil would we need so that the rain doesn’t flush it all down the drainpipes? Do I use grow bags? Do the plants need to be big? Do I start with a corner or does the whole roof have to be planted at once? So you can see now how I don’t have time for boredom. The mind is a wonderful thing and the most helpful thing when in pain is distraction. If you’re alone and there’s no one around to help take your mind off things then it’s down to you and your imagination.